A key aspect of scouting is community service and at Pack 713 we try to plan service activities that support our local communities and houses of worship. In the past, our scouts have arranged for the evening iftar (meal) during Ramadan at the WDM Mosque on West Belfort. The scouts help arrange the tables, prepare the table settings, serve the food and clean up afterwards. It is a great opportunity for our boys to serve during a meal to their fellow brothers and sisters at the WDM Mosque. 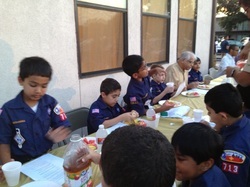 For this year, Pack 713 has arranged for a clean-up and tree planting activity at the Clear Lake Islamic Center. Our Pack will help clean the mosque, paint a room and plant trees. The event will be on January 5th at 10AM. We look forward to having all our scouts join and serve their community.